I am a cancer free, survivor patient treated with IPT/IPTLD. Testimonials: PROSTATITIS TREATMENT USING I.P.T. 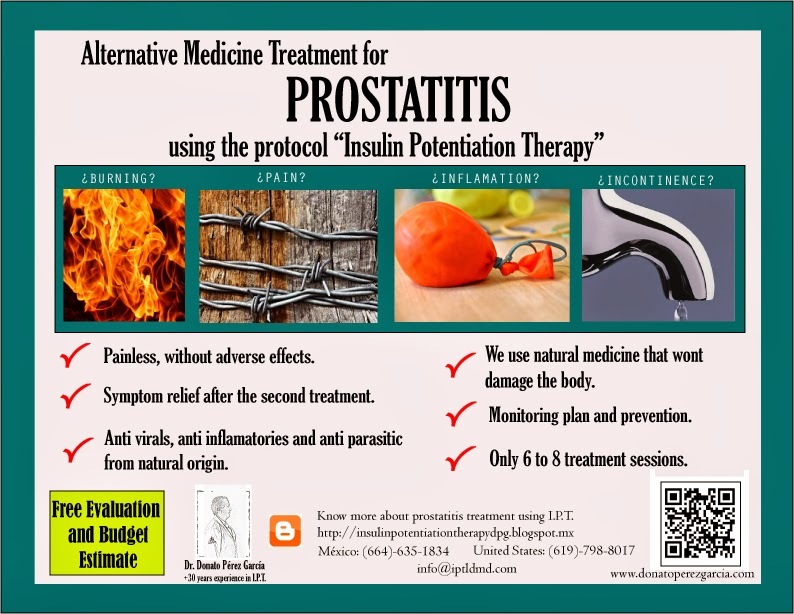 Prostatitis is a very painful medical condition that affects adult men, due to prostate inflammation. The most common cause for prostatitis is due to viral or bacterial infections, there’s an acute and chronic type. The most common symptoms are pain and difficulty urinating, incontinence, painful ejaculations, genital discomfort, urgent frequency to urinate, specially during nighttime, lower back pain, discomfort and burning sensation in the pelvic area. If not treated effectively, prostatitis can be recurrent and from being acute, may become chronic, developing complications that with time will be longer and harder to treat. A prostatitis treatment using the method I.P.T. and Biological Medicine, offers unique benefits compared to conventional medicine. First, a fine combination of antivirals, antibiotics, antiparasitics and anti inflammatory medicines are selected, these are of natural origin that will not damage your system, potent yet gentler on your body, protecting the immune cells to fight the infection. Depending on the severity of the condition, 6 to 8 treatment sessions are suggested. Patient will notice reduction in pain and inflammation after 2 treatments, it’s painless and there are no adverse effects. Once cured, the patient will receive a follow up and prevention plan, to avoid recurrences. www.donatoperezgarcia.com o call an I.P.T. Representative today.